Part of 100 Days, marking the countdown to the 15th UN Conference of the Parties on Climate Change (COP 15) opening in Copenhagen on 7 December. The Noit School is an informal structure developed for the study of the theoretical ideas of the British artist John Latham (1921 - 2006), in particular his concepts of Flat Time and Eventstructure. The School's reading group, the Know Source, meets for detailed examination of Latham's writings. This meeting, the first to take place outside Latham's former home and studio, Flat Time House, will focus on his 1972 work Big Breather. The Breather was a 9-metre high Perspex tube filled with a quantity of seawater representing one square foot of the sea's surface, topped with a giant bellows. As the bellows inflated and deflated twice daily, the water moved up and down within the cylinder, simulating the movement of the tides in response to the gravitational pull of the moon. John envisaged the Breather as a prototype for a structure that could be used in larger numbers for the capture of tidal energy. The meeting will be attended by members of the Noit School including artist Neal White (Office of Experiments), Antony Hudek and Athanasios Velios (John Latham Archive), Elisa Kay (Curator FTHo), and John-Paul Latham (Senior Lecturer in the Department of Earth Science and Engineering at Imperial College, London). 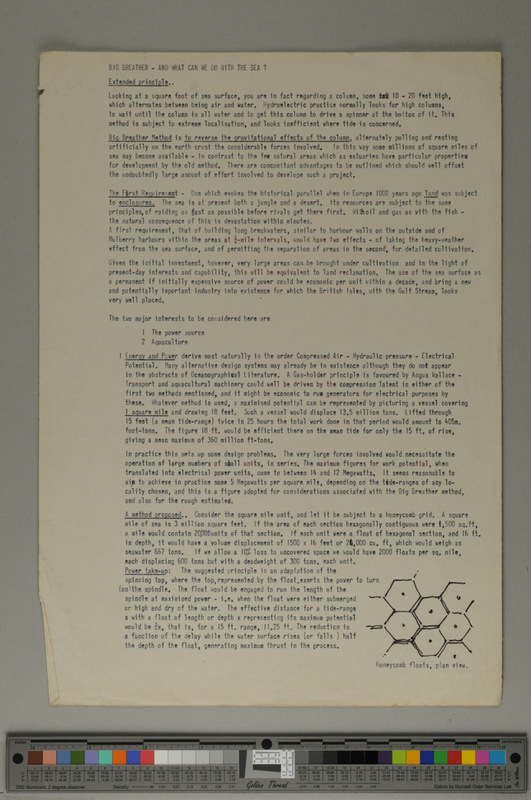 Copied below are transcriptions of three documents, the originals of which are held in the John Latham archive. 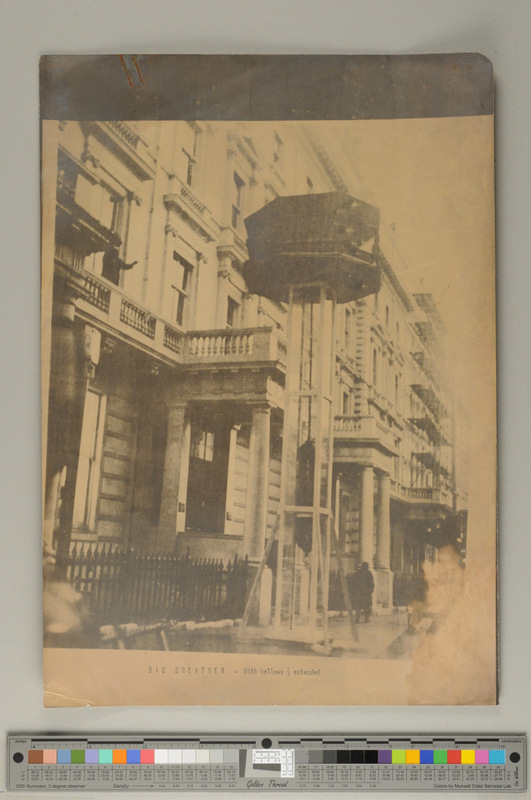 - A photograph of the Big Breather, installed outside Gallery House (now the Goethe Institute) on Exhibition Road, South Kensington. 1 The indication of a new emphasis which could, or should, be placed on this system - as an insurance policy if no more, taken out against the possible failure of advanced technology to solve a wide variety of encroaching problems. In the context of disputes over rights to the sea, fish, that will never resolve finally, a straightforward procedure is suggested. Two necessities, food and energy, are derivable from the system without (avoidable) depreciation of any natural resource. Fossil fuels must be endlessly extravagant to burn. The big problem, not apparently recognised as a simple one relatively, is the removal of the weather effect from the open sea surface. 4 The authors* of this project (through another theorem) would point out that the financial consideration is basically and decidedly subordinate to the 'commodity' Attention, (or 'interestedness') and the generation of that as the real stuff of economics. A very large source of this is to be found as the sea. 'From BIG BREATHER: extension possibilities. 0I-I0 PROJECT - John Latham'. Page 1/3 - transcribed from original document held in the John Latham Archive. BIG BREATHER - AND WHAT CAN WE DO WITH THE SEA? Looking at a square foot of sea surface, you are in fact regarding a column, some 10-20 feet high, which alternates between being air and water. Hydroelectric practice normally looks for high columns, to wait until the column is all water and to get this column to drive a spinner at the bottom of it. This method is subject to extreme localisation, and looks inefficient where tide is concerned. Big Breather Method is to reverse the gravitational effects of the column, alternately pulling and resting artificially on the earth crust the considerable forces involved. In this way some millions of square miles of sea may become available - in contrast to the few natural areas which as estuaries have particular properties for development by the old method. There are concomitant advantages to be outlined which should well offset the undoubtedly large amount of effort involved to develop such a project. The First Requirement - One which evokes the historical parallel when in Europe 1000 years ago land was subject to enclosures. The sea is at present both a jungle and a desert. Its resources are subject to the same principles, of raiding as fast as possible before rivals get there first. With oil and gas as with the fish - the natural consequence of this is devastation within minutes. A first requirement, that of building long breakwaters, similar to harbour walls on the outside and of Mulberry harbours within the areas at 1/2 mile intervals, would have two effects - of taking the heavy-weather effect from the sea surface, and of permitting the separation of areas in the second, for detailed cultivation. Given the initial investment, however, very large areas can be brought under cultivation and in the light of present-day interests and capability, this will be equivalent to land reclamation. The use of the sea surface as a permanent if initially expensive source of power could be economic per unit within a decade, and bring a new and potentially important industry into existence for which the British Isles, with the Gulf Stream, looks very well placed. 1 Energy and Power derive most naturally in the order Compresssed Air - Hydrauilic pressure - Electricl Potential. Many alternative design systems may already be in existence although they do not appear in the abstracts of Oceanographical Literature. A Gas-holder principle is favoured by Angus Wallace - Transport and aquacultural machinery could well be driven by the compression latent in either of the first two methods mentioned, and it might be economic to run generators for electrical purposes by these. Whaterver method is used, a maximised potential can be represented by picturing a vessel covering 1 square mile and drawing 18 ft. Such a vessel would displace 13.5 million tons. Lifted through 15 feeet (a mean tide-range) twice in 25 hours the total work done in that period would amount to 405m. foot-tons. The figure 18ft. would be efficient there on the mean tide for only the 15ft. of rise, giving a mean maximum of 360 million ft-tons. In practice this sets up some design problems. The very large forces involved would necessitate the operation of large numbers of small units, in series. The maximum figures for work potential, when translated into electrical power units, come to between 14 and 12 Megawatts. It seems reasonable to aim to achieve in practice some 5 Megawatts per square mile, depending on the tide-ranges of any locality chosen, and this is a figure adopted for considerations associated with the Big Breather method, and also for the rough estimates. A method proposed.. Consider the square mile unit, and let it be subject to a honeycomb grid (See scan for illustration of 'Honeycomb floats, plan view). A square mile of sea is 3 million square feet. If the area of each section hexagonally contiguous were 1,500 sq.ft, a mile would contain 20,000 units of that section. If each unit were a float of hexagonal section, and 16 ft. in depth, it would have a volume displacement of 1500 x 16 feet or 24,000 cu. ft, which would weigh as seawater 667 tons. If we allow a 10% loss to uncovered space we would have 20,000 floats per sq. mile, each displacing 600 tons but with a deadweight of 300 tons, each unit. Power take-up: The suggested principle is an adaptation of the spinning top, where the top, represented by the float, exerts the power to turn (on) the spindle. The float would be engaged to run the length of the spindle at maximised power - i.e. when the float were either submerged or high and dry of the water. The effective distance for a tide-range x with a float of length or depth x representing its maximum potential would be 3/4x, that is, for a 15ft. range, 11.25 ft. The reduction is a function of the delay while the water surface rises (or falls) half the depth of the float, generating maximum thrust in the process. 'From BIG BREATHER: extension possibilities. 0I-I0 PROJECT - John Latham'. Page 2/3 - transcribed from original document held in the John Latham Archive. Stability: The upper platform has to be rigid enough to support the 300 tons x 2 at the point of load - the location of the brake/lock, at each of the 20,000 points. The rigidity must extend to the sea bed sufficiently to counter the lift - effect when 300 tons is exerted upwards at each point. The weight of platform will be increased with superstructure accommodation, this will assist both the stability and economic aspects. Output: A table of factors outlining the derivation figures for electrical generating machinery is attached. Assuming the figure of 44,000ft-lbs per minute as equivalent to 1 kilowatt, we can arrive at a mean output figure for the 15 ft, 16 ft., and 18ft tide-range/float length. The figure (tons) 300 is an 11% reduction for loss to space, using the 16' depth. The maximum potential of this float on the basis of 100% efficiency is 8,831 kilowatts, this being a round-the-clock mean, per sq. mile or 20,000 float units.. The optimum proportions and number in any cluster being a matter of local circumstance and economics. The next question is one of topographical arrangement. To take the best advantage of the principle it is necessary to take account of the alternative activities the principle one envisaged being aquaculture. 2 Aquaculture A demonstration of a self-sufficient fish-farm was made by Newton Harrison at the Hayward Gallery in 1970, by use of water tanks on display. The opportunities offered by enclosing significant areas of sea would look at least as good as the opportunities offered by enclosing significant areas of land for cultivation, and considering that a 15' band of alternate air/water atmosphere exists together with deep water and that shell fish and other basic life thrives in this band, this activity looks like a very large one indeed. The facilities for handling would require the same non-swell security as the power-source and the platform accommodation. No information is available on the subject of cultivation of sea fish in quantity but a wealth of oceanographical data can indicate the basis. Tide as a power source has often been dismissed on grounds of disproportionate cost per unit but the situation could be changing rapidly in the direction of sea cultivation as a main source for many needs. The scheme taken as directed to any single industrial undertaking might be too expensive. On the basis of integrated activity and of the permanence of concrete in the sea an installation as outlined could be a much better way to spend money than on conventional hydro electrics since it has so many advantages, particularly it would seem for the British Isles. Ten years hence it could be that oil is disproportionately extravagant to burn. The purpose of offering this scheme is to provoke a more informed situation - the figures are in no way vouchable, and are derived from various extract material, by inference. For the purpose of this generalisation see map showing 'EXAMPLE' of a large-scale installation off the coast of Lancashire. For the 400 sq. miles of usable area the breakwater enclosure would approximate to some 750 miles. A figure suggested for the cost, on average, has been GBP1m per mile, with the outside run very much more. The initial sum set aside could be GBP850m, with GBP10m spent on initial pilot scheme. The inner sections can be made ashore and floated into position where they could be expected to last indefinitely, 100 years at least. This cost could be written off over 50 years, government funding as between ministries of Agriculture & Fisheries and CEGB. 'From BIG BREATHER: extension possibilities. 0I-I0 PROJECT - John Latham'. Page 3 of 3- transcribed from original document held in the John Latham Archive. The installation,floats and anchorage with platform have to be estimated somehow. The floats should be easy to make in mass in shipyards. The drilling and ballast on sea bed and basic structure could come to GBP3000 - GBP5000 per float, which at 20,000 floats per sq. mile would need GBP800m. Some additional machinery as electrical plant would add a possible GBP200m. The float equipment might be subject to replacement but the concrete hulls should be durable. If the figure for installations is written off over 25 years and the machinery over 5 years, we have a figure of GBP800m. being paid off at GBP32m p/a, GBP17m, p/a off Item 1, with a machinery bill of GBP40m. p/a - a total of GBP89m. p/a to be found. The equipment and accommodation as ancillaries would be expected to come from their own sources. RETURN ON OUTLAY - very variable estimates might be written down and be pointless except to indicate a basic substantial profitability. On the basis of land under intensive cultivation the sea should be at least as fertile. A figure of GBP1000 per acre seems a reasonable target. If we have 500 acres per sq. mile this leaves 60 acres for sea lane, and another GBP 1/2m per sq. mile, the same approximate returns. The warehousing and working facilities would add to the income from he platform areas considerably. Given and annual estimated income therefore of GBP200m., a initial expenditure of GBP1850 or GBP2,000m. should look an attractive proposition. Given the present day attitude and treatment of the sea resources some action of this kind seems more than that.